We’d love your help. Let us know what’s wrong with this preview of Dying Words by Nicholas D. Evans. The next century will see more than half of the world's 6,000 languages become extinct, and most of these will disappear without being adequately recorded. Written by one of the leading figures in language documentation, this fascinating book explores what humanity stands to lose as a result. This book explores the unique philosophy, knowledge, and cultural assumptions of l The next century will see more than half of the world's 6,000 languages become extinct, and most of these will disappear without being adequately recorded. Written by one of the leading figures in language documentation, this fascinating book explores what humanity stands to lose as a result. This book explores the unique philosophy, knowledge, and cultural assumptions of languages, and their impact on our collective intellectual heritage questions why such linguistic diversity exists in the first place, and how can we can best respond to the challenge of recording and documenting these fragile oral traditions while they are still with us. To ask other readers questions about Dying Words, please sign up. DYING WORDS by Nicholas Evans makes a case that the rapid disappearance of languages around the world risks depriving the human race of vital knowledge. Over the past decade or so, a number of books have been published about language diversity in danger and why it matters, but DYING WORDS is perhaps the most theoretically detailed survey so far. In spite of suggestions in the introduction that Evans is writing for a fairly popular audience (for example, he describes phonetic transcription and gl DYING WORDS by Nicholas Evans makes a case that the rapid disappearance of languages around the world risks depriving the human race of vital knowledge. Over the past decade or so, a number of books have been published about language diversity in danger and why it matters, but DYING WORDS is perhaps the most theoretically detailed survey so far. In spite of suggestions in the introduction that Evans is writing for a fairly popular audience (for example, he describes phonetic transcription and glossing as if the reader doesn't know), it swiftly becomes clear that he is writing for a university audience that has at least basic training in linguistics. If you don't have such formal training, you'll probably be over your head. Instead, try K. David Harrison's books The Last Speakers, written for the general public, or ASIN:0195372069 When Languages Die, more theoretical but accessible to dilettantes. * Languages may contain data on the natural world that scientists have not yet discovered. This theme forms a large part of other books on the threat to language diversity, but Evans gives it the least attention. Still, he does cite several recent cases where botanists or zoologists were led to new discoveries after encountering speakers of indigenous languages. * By looking at a wide array of languages, we can discern what ways of speaking can, through common use, become grammaticalized, that is, become obligatory in discourse. * There are still undeciphered writing systems, but if descendants of the language inscribed in them still survive today, they can provide vital clues for decipherment. * Languages are inseparate from their poetic traditions, and evidence from smaller languages reveals mankind's capacity for poetic techniques features that may not be attested in cultures documented to date. DYING WORDS will aid budding linguists to understand the importance of language diversity so that they can then make their case to the public. However, it has its flaws. One issue, as I mentioned before, is that Evans is clearly writing for an audience trained in linguistics, but he still laboriously explains concepts that such readers would have already learnt very early on (such as IPA and the comparative method). There are other points where the book could have used more attention from the editor. Early in the book Evans claims that the name "Roma" for the Gypsies is taken from their residence in the Byzantine (or Eastern Roman) Empire, but in a later chapter he notes that the name Roma was brought from India and related communities in the Middle East also have variations of the name. At one point he says Coptic may have survived until the 19th century in some places, and later he calls it "extinct in everyday life for a thousand years". The book was marred a little by not having a totally clear argument other than "marginal languages are important", but on that level it gives the reader, especially one unfamiliar with linguistics, a great overview of linguistic diversity. I thought that at times it focussed too heavily on the boons to Science with a capital S, rather than the immediate benefits to speakers of those languanges. Evans does make some effort to encourage the reader to value endangered languages (and multilingualism The book was marred a little by not having a totally clear argument other than "marginal languages are important", but on that level it gives the reader, especially one unfamiliar with linguistics, a great overview of linguistic diversity. I thought that at times it focussed too heavily on the boons to Science with a capital S, rather than the immediate benefits to speakers of those languanges. Evans does make some effort to encourage the reader to value endangered languages (and multilingualism) as an end in itself, but most of the time that value becomes instrumentalised - languages are good because of how they can help scientific progress. That said, in order to be able to talk about these languages at all, linguists like Evans have had to dedicate their lives to tiny communities of speakers, accomplishing monumental descriptive work against the overwhelming tide of language death, and this work has itself been considerably effective in keeping those languages alive. So the praxis behind the book is commendable, and the last chapter argues well for new approaches to field linguistics that put the communities of speakers first, making linguistics less about empowering Western Science and more about giving new strength to dispossessed people. Dying Words has the unfortunate honor of being a fascinating book about an often sad subject: the rapid loss of human language diversity happening now. As Nicolas Evans convincingly writes, it's only by studying a large number of very different languages that we can begin to understand just how language came about and what linguistic universals, if any, exist in our cognitive capacity. Much of the book recapitulates my linguistics studies - which is not a bad thing! - covering the essential grou Dying Words has the unfortunate honor of being a fascinating book about an often sad subject: the rapid loss of human language diversity happening now. As Nicolas Evans convincingly writes, it's only by studying a large number of very different languages that we can begin to understand just how language came about and what linguistic universals, if any, exist in our cognitive capacity. Much of the book recapitulates my linguistics studies - which is not a bad thing! - covering the essential ground of historical linguistics and how to use language difference to reconstruct change. Evans elegantly explains many examples of how rare and endangered languages provide crucial keystones to particular theories of language relatedness and thus human migration, and sometimes give us examples of language structure and usage we didn't even think was possible until linguists in the field had seen it. The rise of a few dominant world languages has biased and narrowed our possible ways of expression, and we are the poorer for losing these minority tongues. 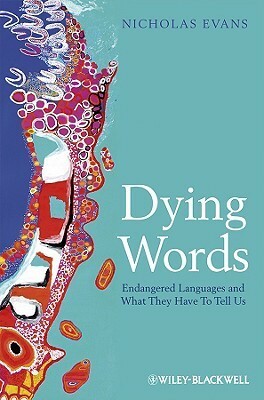 Dying Words also focuses largely on the world of Australian aboriginal languages, which we all should know more about. Evans gives fascinating examples of deliberate language differentiation between groups to mark in-group identity, and the unbelievable case of Damin, a ceremonial language/register of the Lardil people which has a completely different sound system from Lardil and the only use of click consonants outside Africa. Wonderful combination of information on the development, variation and potentially dying of language, and portraits of specific dying languages and its last speakers. The scientific parts are solid and easy to follow, with a great diversity in languages and studies examples are derived from. The human parts, the portraits and the mentions of the author's friendships with the last speakers, are very warm and engaging. Good stuff. A very passionate book - to its credit. It starts like it is going to be a detailed examination of the linguists belly button by using various aboriginal languages. After that it becomes a very informative book delving into numerous topics reflecting deep experience. Often the book is slightly politically incorrect, which is refreshing. However, the author frequently goes off into the humiliations suffered by minority languages and their speakers. I think this book would be good as a textbook in an introductory linguistics course. The author is passionate about linguistics in general and the extremely obscure, dying-out languages in particular, and he has convinced me of the importance of both. I had no idea that languages could be so different, or say so much about a culture's history and mindset. This is the kind of book that might cause a young undergraduate student to seek a career in the linguistics field. I found it fascinating. For those linguistic bent, this is an absolutely rewarding read. In no way is this book dry or academic. To me, this book made me aware of all the hidden treasures locked in languages around the world. I can't help now but to wonder what there is to know, but that which we cannot know because of a language we don't speak. Great book. Many facts and many thoughts. A must-read for a linguaphile. Anfangs sehr, sehr interessant, allerdings fehlten mir die Beispiele für die verschiedenen sprachlichen Besonderheiten. Gegen Ende hin wurde es immer theoretischer. Très intéressant! C'est un peu complexe par moment, alors idéalement le lecteur devrait avoir une base en linguistique pour bien suivre.